Margaret P. Gallagher, age 95, of Reynoldsburg, passed away peacefully on July 10, 2018. Marge was born in 1923 to the late Patrick and Matilda (Rapp) King in Brooklyn, NY where she was raised over her Father's pub. Prior to marriage, she worked for Guarantee Trust Company in Manhattan until she was married to her beloved husband, William J. Gallagher, and became a busy and devoted mother to six children. 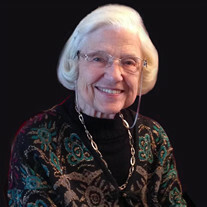 She had an unwavering Catholic faith and was a member of St. Agnus Parish in Brooklyn, NY, St. Clare Parish on Staten Island, NY and, was an active member of St. Pius X Parish and its Senior Fellowship Club in Reynoldsburg, OH. Marge was also involved with the Reynoldsburg Seniors, the Bell Telephone Pioneers, her Bridge Clubs (where she excelled), and her Euchre Club for more than 50 years. To say she was the life of the party would be an understatement. Her smile and laugh lit up every room she entered and she made many lifelong friends through her church, her neighbors, her travels and her associations. She loved to entertain, to read, play cards, and to travel, especially with her husband, Bill, and later, on the annual Gallagher Family Beach Vacations where she would be surrounded by all her children, grandchildren and great grandchildren. Her motto is "Why Not?". Her family is grateful for all the laughs, the smiles, the songs and the stories. There is a table in heaven with a fresh deck of cards and a bottle of wine calling her name. " Skoal! Cheers!" to a life well lived and well loved. Survived by her six children: Patricia Gallagher, Virginia (Patrick) Leahy, William (Collette) Gallagher, Michael (Sonja) Gallagher, Margaret (Brian) Bethel, John (Christine) Gallagher and also by her "special daughters" Christina Burke and Mary Lou Purdy. Marge is blessed with 15 grandchildren, 20 great grandchildren and many nieces and nephews. Marge is proceded in death by her husband, William J Gallagher; by her siblings Joseph King, Ann Farrell, Marion Mahoney and Andrew King; and by her great grandaughter Riley Schulze. The family will receive friends on THURSDAY, July 12, 2018, 5:00-7:00 PM at PFEIFER FUNERAL HOME, Reynoldsburg. A mass of Christian Burial will be celebrated on FRIDAY, 10:30 AM at ST PIUS X Catholic Church, 1051 S Waggoner Rd, Reynoldsburg, OH 43068 with Father David Young officiating. Burial will follow in St Joseph cemetery, Lockbourne. Online condolences available at www.pfeiferfuneral.com.